What is online affiliate marketing? Great question, and if you’re asking, you’ve probably been researching how to make money online. That’s what you call passive income. The commissions came in while you slept. This is an example of affiliate marketing. It’s a form of revenue sharing between you and a merchant. Let’s take a better look at what it is, and how it works. And if you’d like to know where I learned all this, click here. 3 How Does Affiliate Marketing Work? 4 How Do You Make Money? 6 How Do I Start? Wikipedia defines it as “a type of performance-based marketing in which a business rewards one or more affiliates for each visitor or customer brought by the affiliate’s own marketing efforts”. Simply put, affiliate marketing is an agreement between you and a company, to promote their product and receive a commission if someone buys that product. So…. you get paid for selling other people’s stuff. E-commerce has grown rapidly over the past 20 years. Many retail businesses have an online component while others are strictly online with no brick and mortar store. Think of Amazon and eBay. After the start of the World Wide Web, many businesses like Amazon, for instance, began to see the benefit of paying commissions to their “associates” who sent them potential buyers from the associate’s own online business. If a sale occurred, the commission was paid to the associate. This “pay for performance” model is very beneficial for merchants. The only cost the merchants incurred is the commission. There are no salary or advertising budgets required. Today, online shopping is one of the most popular activities on the Internet. 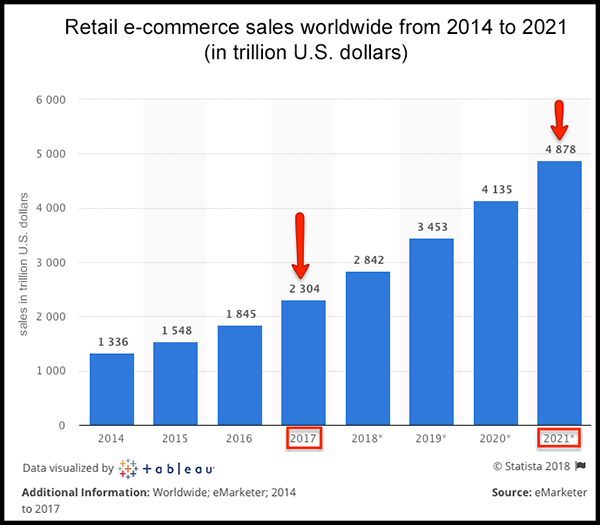 In 2017 alone, worldwide e-retail revenue amounted to 2.3 trillion US dollars. The projected revenue by 2021 is 4.88 trillion US dollars. Another important factor is that affiliate marketing can be done by anyone with an internet connection. And these statistics increase every year. Take a look at the global stats below. When you total the 2009 figures against the 2018 figures, it comes to a whopping 133% increase. Can you imagine where it’ll be in 5 more years? 10? 20? 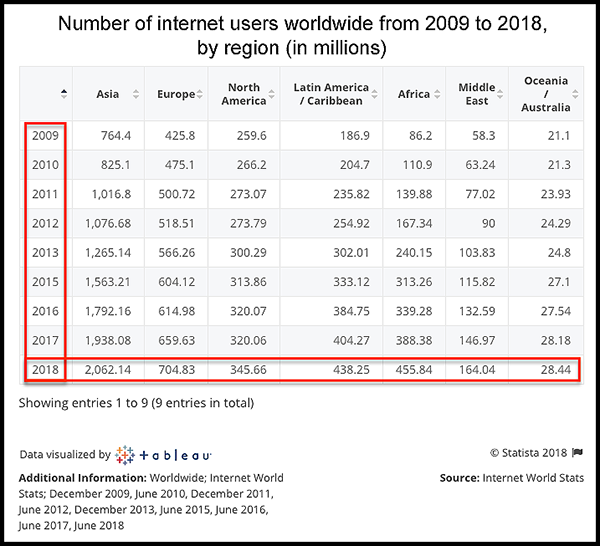 So when you hear things like “online marketing is too saturated”, or “affiliate marketing is dead”, it’s just not true. There’s no better time to start your online business. The future is only looking brighter! Some people like to include a fourth party, called The Network, but they are not always a part of the relationship. This can also be known as the creator, the seller, the retailer, or the vendor. Any business as large as Amazon, to as small as a single person who’s developed an app for smartphones, can be a merchant. They develop their own affiliate program, which allows others to promote their products for sale. 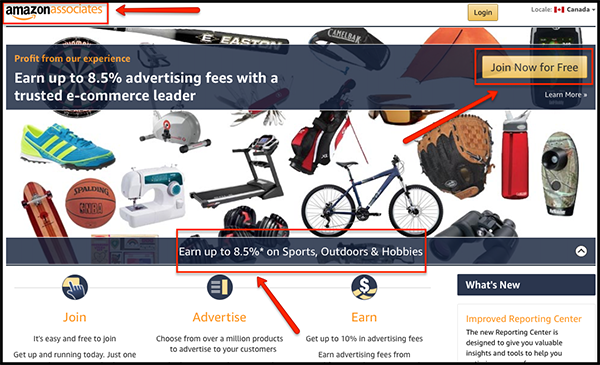 If an affiliate sends them a customer, the affiliate is rewarded. Having affiliates promote your products is a very cost effective way of getting customers. You don’t have to pay out any advertising costs, and only pay out a percentage of the profits you make when a customer is sent to you and buys. Amazon is probably the biggest online retailer. Their affiliate program is called Amazon Associates, paying out up to 10% of qualifying purchases. This can also be known as the publisher. This is YOU in this relationship. Affiliates can be a single person all the way up to large companies. Commissions can range from a few hundred dollars per month to millions per month. And it all boils down to the marketing of the products. An affiliate spends time promoting one or more products. They try to convince their readers of the product value, hoping their customers will buy. And when the customer does buy, you get paid a percentage of the profits. How, you ask? I’ll get into that further on, ok? Below, is a screenshot of someone’s fitness website, promoting hand weights. As you can see, they are affiliated with more than one merchant: Amazon, and Walmart. This is very effective with “Review” sites. This is also known as the consumer. They are the third leg of the stool, you might say. Without their purchase, there’s no commission and no revenue sharing. They complete the cycle. The customer can come from many different places, depending on where the affiliate has chosen to market the product. They may have found you by searching on Google (content marketing), on social media (Facebook, Pinterest etc. ), or any online advertisement. The customer may, or may not know they are part of an affiliate marketing system, though most affiliates tend to be transparent these days. And there’s no need for the customer to worry about the cost. 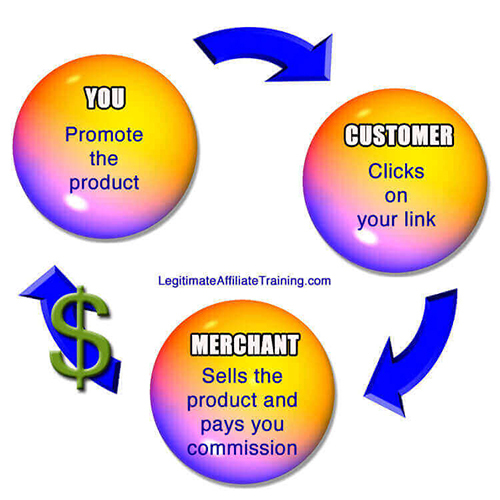 They are paying the same price through the affiliate as they would be on the merchant’s site. The commission paid out to the affiliate has no bearing on the customer price. Then the customer clicks on the affiliate’s link, like in the picture above ($300* from Walmart), they’re sent to the Walmart site to purchase. This party deserves an explanation because many affiliates do use them. The network can be the intermediary between the affiliate and the merchant. If a merchant creates an online course to sell, they have the choice to arrange their commission structure directly with the affiliate, or they could let a network arrange all the details. Have you ever heard of Clickbank? They are one of the more popular affiliate networks online. Many creators of digital products sell through these networks, and you, as the affiliate, have no choice but to use them. 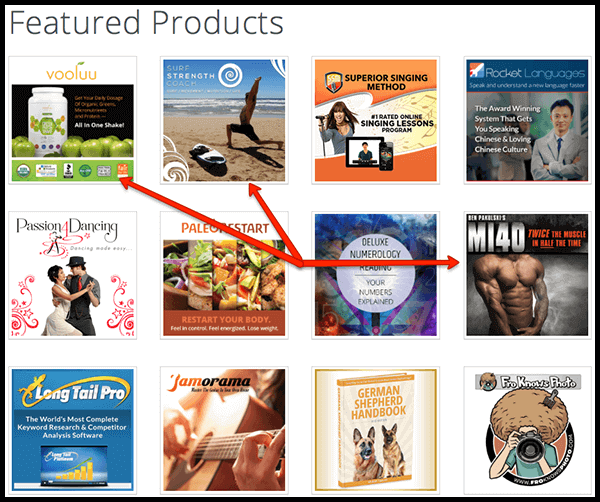 As soon as you check out their website, you can immediately see some featured products. There’s already three I see for any fitness website. Depending on your niche, there are always many products to choose from. I came across an excellent YouTube video that explains affiliate marketing. I thought you might enjoy seeing this. Unfortunately, his website is no longer available, but the explanation he gives is timeless. All affiliate programs provide you with special links that track who sent which customer, and how much was purchased. They then send you the commission you earned for sending them that customer. When you start your online business, you begin by choosing a niche that interests you. Then you want to find products, related to that niche, to promote to your readers. I would recommend you start blogging or article writing about your niche, for a little while, before you start applying to affiliate programs. 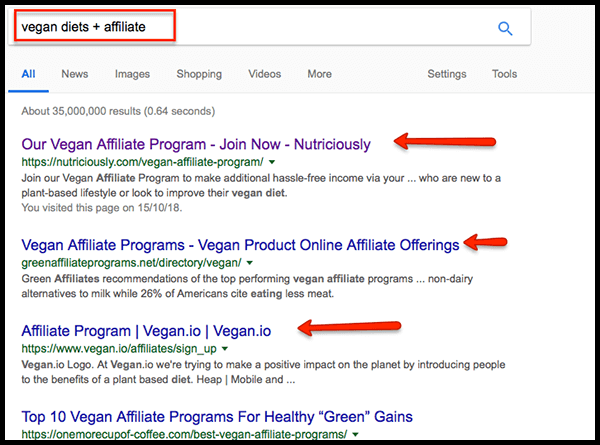 The easiest way to find an affiliate program is to type your niche into the Google search bar followed by + affiliate. The first three search results are programs to check out. The first one brings you to their affiliate page, and one digital product they sell is “The Complete Vegan Starter Kit”. And wow! 50% Jackpot! Now you need to sign up for the program. Some sites, like this one, have certain criteria to qualify as an affiliate. Some companies can inform you immediately, whereas this company states within 24 hours on weekdays. Some can take up to a week or more. It varies from industry to industry. If accepted, you will get an email, giving you the information you need to log into the merchant’s affiliate program. From there, you will receive your affiliate ID#. They will guide you through the process of setting up an affiliate link that you can use on your website or advertising campaigns. This link is then embedded in some text in your article, in an image, or in a button, which may say “Buy Now” etc. The affiliate ID# you receive is a tracking link unique to you only. When your customer clicks on that link, your ID# is stored in a “cookie” which is stored on their browser. If you’re fortunate to find an affiliate program with a long cookie life (many days or weeks), you won’t have to worry if the customer doesn’t purchase right away. If your customer comes back to it a few days later, the sale is still attributed to you. The tracking system takes care of everything else. It keeps track of each individual affiliate’s sales and records the commissions. The merchant decides how often they pay out. Either when your commissions reach a certain threshold, or monthly, bi-monthly, etc. Many pay out directly to your PayPal account. Some will automatically deposit into your bank account or write you a cheque. There is no need to create, buy, or store inventory. No need to worry about shipping or delivery services. The merchant takes care of any customer service and refunds. There’s a very low cost of starting your business. Affiliate programs are free to join and any initial costs should be minimal. Future costs arise with scaling an already profitable business. Your market is global. Because you’re online, you have the opportunity to reach people all over the world. Your potential for passive income increases. For instance, an affiliate program may have a membership option, which has recurring payments. Once your customer signs up for a membership, your commissions come monthly or annually, as long as they remain a member. You can work from anywhere there’s an internet connection. At home in your P.J.’s, in a coffee shop, on vacation, etc. It affords you the ultimate freedom. This can be an additional income stream to supplement your current income or scaled to become a full-time income. There are many different ways to apply affiliate marketing to create more than one income stream. For example, using social media, or email marketing. There are always “gurus” taking advantage of a good thing and giving affiliate marketing a bad name. They’re the ones promoting the get-rich-quick schemes to line their own pockets. if you hear the phrase “set it, and forget it”, or “make thousands in your first week”, run! If it’s too good to be true, no matter how convincing they are, it’s a scam. A bad affiliate referral can ruin your reputation. Always choose reputable and reliable merchants or networks to work with. Unscrupulous people will try to hijack your affiliate ID so they get the credit instead of you. But there are ways to cloak your URL’s if allowed by the merchant. The customers aren’t yours for future promotions. You never know who clicked on your links. But… you can build your own email list to promote to. It can take time to generate enough traffic to create an income. You’re working against the competition, so persistence and patience are key. The learning curve can be difficult without proper training. Don’t despair… I know a place, lol. The first thing you need to know is that like any profitable business, this takes time, consistency and patience. If you read somewhere, that you can earn money overnight, they’re lying to you in hopes of selling their product. But if you’re willing to put the effort in, your business can become successful and very profitable. There are many places online to get information on affiliate marketing. So much so that it can be overwhelming. Many articles and blogs will tell you that you need to find a niche, build a website, find keywords, and write content. The only problem is that much of the advice from site to site contradict each other. Then there’s the need for help, support, and encouragement. So finding the right community to ask questions when you’re stuck, is crucial. See what I mean by overwhelming? Trust me, I’ve been there. Yes, I’ve tried several products and platforms. Remember the “gurus” I talked about earlier. Well, when I started down this road, I got sucked into a couple of offers that turned out to be scams. It was pretty discouraging to lose money and not learn anything useful. There were times I thought I should just quit, but I knew too many people who were successful at it. If they could do it, so could I. So I clung to my dream of providing us with a great retirement and kept looking and researching. So we’ve talked about what affiliate marketing is and how it works. Now all you need is the proper training and tools to achieve your successful business. Without training, you’ll flounder around until you want to give up. So this is my sincere recommendation. I’d like you to check out the platform I found to help me succeed. They have everything you need under one roof. No need to skip around from site to site. They provide all the training you need, the tools to get you up and running, a wonderfully supportive community (the only one of it’s kind online today), and much more. And it won’t cost you a penny to start! Really! You can sign up for a free starter membership, no credit card necessary. This is how I started. It’s how I recommend everyone starts. There’s no risk involved and you get to test drive the entire platform to see if you enjoy it. If you’re serious about making an online income, I know you’ll love it too. Please click on the picture below to read my insider review. You’ve made the first step of researching something you’d like to do. So now why not take the next step and try it out, risk-free. I’ll meet you on the inside and be there for you every step of the way. Let me know if you have any comments or questions, below, and I’ll get right back to you. This is such an amazing guide for newcomers. I also have a website but I am new to this field and find your article so so helpful. Actually, this is what I was looking for, and I am impressed with your work. Thanks once again for the amazing and useful article. I’m so glad you found it helpful. It’s nice to hear because that’s my focus for this business…to help people. Especially newbies like yourself. If there’s any way I can help you along with your new journey, please contact me. Suzanne, well articulated. Well written. Your website looks so great and your niche has highly sought after information. How did you come up with all those great pictures? They helped in your story. Hi Regina, and thanks for your kind words. That’s the focus of my business, to help others start their own successful and profitable online businesses. I’ve always said, if I can do it, anyone can, LOL. Starting out as a newbie can be frustrating and overwhelming. This is why I write different tutorials to help explain things. And also reviewing different products and platforms they may come across. The internet is amazing but can mislead many entrepreneurs as well. I learned the hard way and wish to help others avoid those mistakes. P.S. I have access to great images on the Wealthy Affiliate platform as well as many free image sites online. I really enjoyed the article. You explained affiliate marketing very well. You also highlighted the benefits of Wealthy Affiliate quite well. I, too, fell for a couple of those scams before I quite literally stumbled upon Wealthy Affiliate. I’m so glad that I did! The benefits of belonging to the kind of open and honest community that Wealthy Affiliate has are amazing! As you said, there is also the training and even the tools not only to help you get started but to help you along the way! I’m sorry you fell for some scams online. It’s so frustrating, isn’t it? I wish I could prevent beginners from falling for all those scams, and that’s why I write reviews. Wealthy Affiliate is the best, and safest place to learn how to start your own online business. I’m glad you’re here with us. The best part is having everything you need under one roof. Saves so much time and money! Oh wow, very interesting post. I love how you incorporated varied photos. It made your post quite engaging. I wish I saw your post when I was researching on starting an online business. Hi Pearl, and thanks for your kind words. It’s never too late to add to your training. I find that things change so quickly in this industry that I’m always learning something new. That’s how we stay ahead of our competition. And that’s why I love Wealthy Affiliate. They are constantly upgrading or adding new training that goes hand in hand with the current landscape. If you need any help, let me know. I’ll be glad to help. Wealthy Affiliate helped me earn more than $10,000 from one of my niche hobby websites. It takes quite a while to get the traffic and conversions but it’s worth it in the end. Hi Dan, and thanks for commenting. I’m so happy to hear of your success. Yes, it takes time, but when it starts to snowball, it’s definitely worth it. The hardest part is the patience. That’s why I keep talking about it, lol. Imagine if you had given up before your business took off? Unfortunately that’s what many aspiring entrepreneurs do. They believe it’s not working, and give up. Little did they know that another month or two could have made all the difference. There are so many choices out there for affiliate marketing, but Wealthy Affiliate definitely stands above the rest. Great training and a great team to work with. Hi Tara, and thanks for commenting. Yes, Wealthy Affiliate is definitely the best platform online. And the free starter membership is wonderful for people to test drive everything. They’re the only platform that provides this with no pressure to join. And the live community is the only one of it’s kind online. It was and still is a great help to me. Hi Todd. Welcome to the Wealthy Affiliate family. It’s an amazing platform. All the help you need is at your fingertips. This is a lovely well thought out article. Thank you for explaining everything so clearly. I am glad that you found a programme that works really well for you. I was just wondering if you recommend Affiliate referral programme over any others? Hi Bec. Thank you for your comment. Yes, I definitely recommend Wealthy Affiliate over others I’ve looked into. I’ve written a review on another program if you’d like to compare. https://legitimateaffiliatetraining.com/is-affilorama-a-scam There are so many out there that just want your money or are out of date. I agree with you about taking the helpful approach. I am trying to do that with my site as well. I feel it makes you more trustworthy, and provides more value to the reader than just affiliate links. Nice article. Hi Rob and thank you. I find nothing more annoying than finding pages and pages of “do this” with affiliate links. They are so impersonal. Everyone wants help making their decisions from “a friend”. I enjoyed reading about how you can earn money with a website about affiliate marketing. It seems like a great way to get started without having your own products to sell. It is amazing to read that you can access training for Free. I have looked at many other online training programs about affiliate marketing and I’ve never found one that offers free training. With all those I have looked at you need start with a paid subscription. Best wishes to you Suzanne with your affiliate marketing business. Suzanne, affiliate marketing is a great way to start an online business. In order to make money online you will need patience, motivation and training. What I appreciate about Wealthy Affiliate is the training and support of both the community and owners of WA. 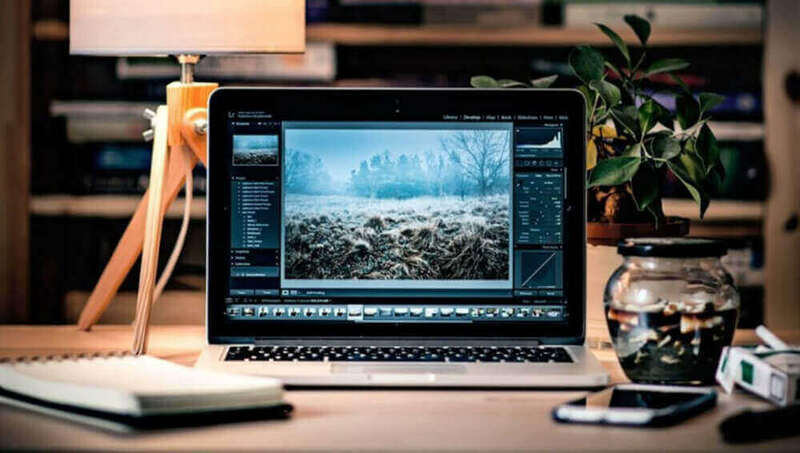 The training within WA covers every aspect of what is needed in starting one’s very own online business -from A to Z. It’s a must for anyone who is truly interested in making money online. Hi Don. You’re sure right about Wealthy Affiliate’s training and support. Any time I have a question, I get a response immediately. This is definitely the best way to learn affiliate marketing and start your own business. Affiluate marketing sounds like an excellent way to earn a passive income online. Have you ever heard of drop shipping. I heard people make a lot of money online with that method as well. Hi Max. Yes I’ve heard of drop shipping but haven’t looked into it. There’s still so much to learn here at Wealthy Affiliate. Maybe in the future! Your site is very nicely laid out and the fact you kept it to the point and interesting made it and easy read! I initially enrolled for the free trial and was blown away that a credit card WAS NOT required! I am now a yearly member! If your readers are looking for an awesome opportunity where every one is truly helping each other, you owe it to yourself to at least take the free test drive! If you do not learn anything or feel its not for you, you have lost nothing! But I promise you will come back after being sticker shocked by some of the promises of glory for up in the thousands just to get started and you can get it at Wealthy Affiliates for a steal! With support and mentors that aren’t in your pocket to answer a question! Wishing you success and hope everyone that stops by at the very minimum takes the free test drive of the program! Yes again for free! Good luck my friends! I so agree with you Ray! I started out for free as well, and it didn’t take me long to become a premium member. The training and immediate help is top notch, let alone being able to talk to the owners! I’ve just scratched the surface of available information. So much more to learn.